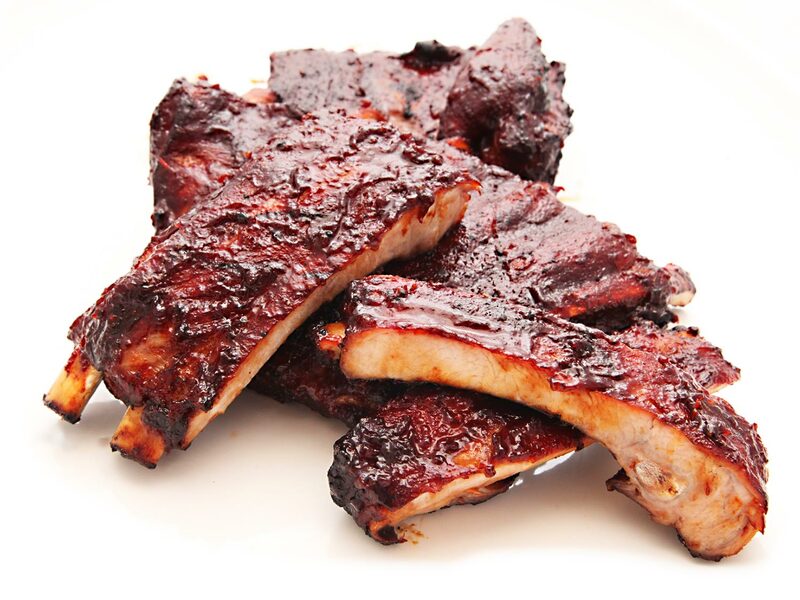 Ribs are traditionally slow-cooked in a smoker in order to get their copious amounts of connective tissue to convert to gelatin, turning the tough ribs tender. The rate at which this conversion takes place is a function of temperature and time; The lower the temperature, the longer it takes. At the same time, the lower the temperature, the more internal moisture the ribs will retain as they cook. So while a rib cooked at 145°F / 63°C will take about three times longer to tenderize than those cooked at 165°F / 74°C, they will end up with a more succulent, meaty texture that eats almost like an extra-tender steak. Ribs cooked at a higher temperature will have a more traditional bbq rib texture with well-rendered fat and meat that shreds as you eat it. Note: Barbecue sauce can also be omitted if you prefer a dry-style rib. 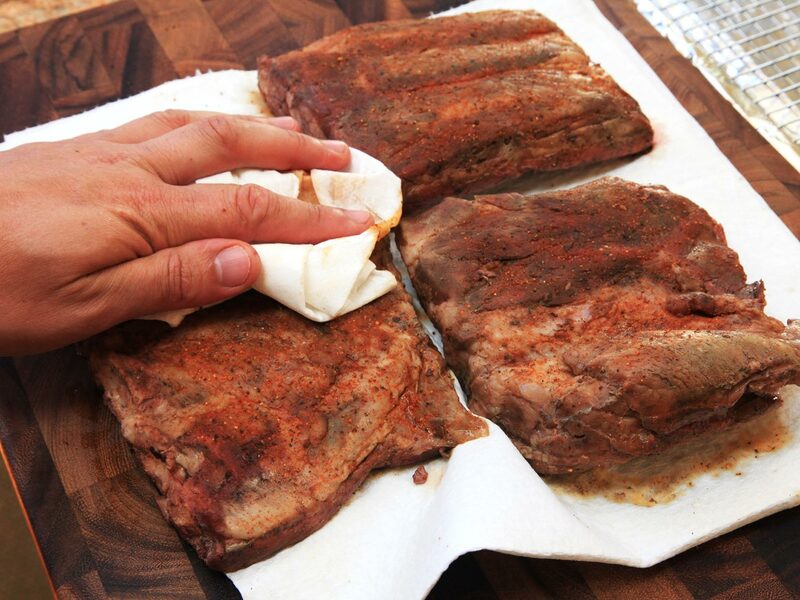 For dry-style ribs, re-rub ribs with reserved 3 tbsp / 45 ml of dry rub after removing them from the vacuum bags in Step 13 and omit saucing steps when ribs are in the oven or on the grill. 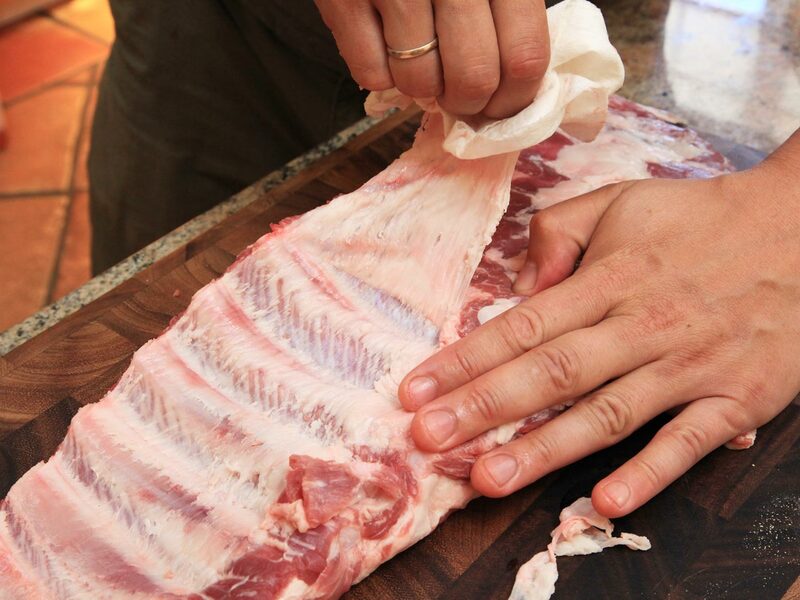 Remove the papery membrane on the back of the ribs using a paper towel or kitchen towel to grip it and pull it away in one piece. Divide each rack of ribs into three to four portions with three to four ribs each by cutting through the meat in between the ribs. 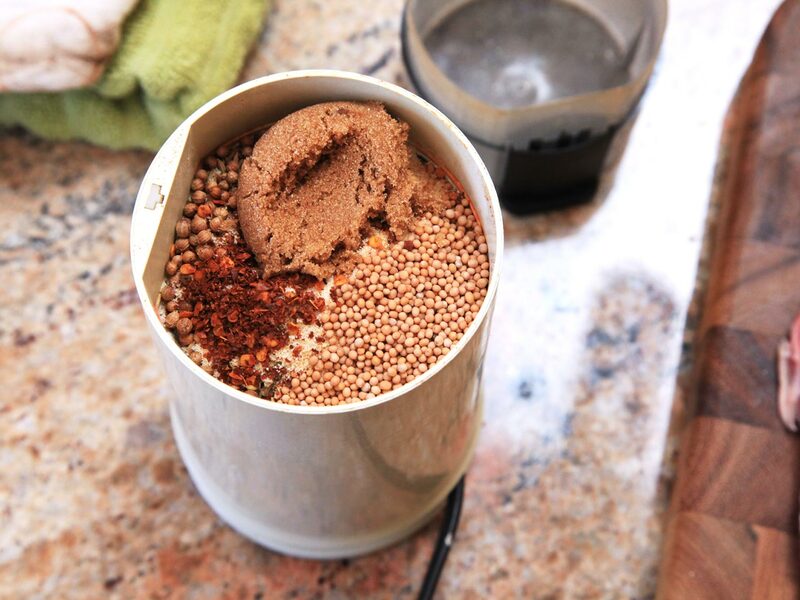 Working in batches, combine the paprika, brown sugar, salt, mustard seed, black pepper, garlic powder, oregano, coriander seed, and red pepper flakes in a spice grinder and reduce to a fine powder. 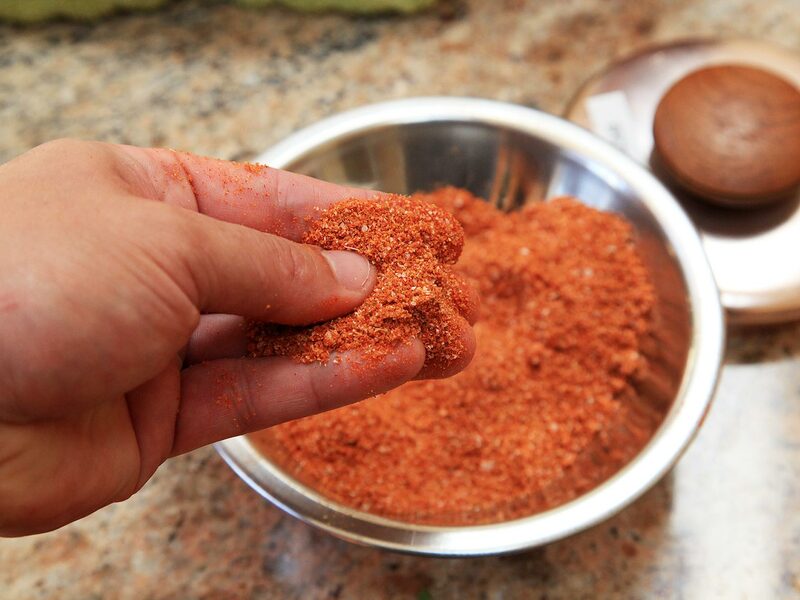 Set aside 3 tablespoons / 45 ml of spice rub mixture. Rub ribs generously on all sides with the remaining spice rub mixture. 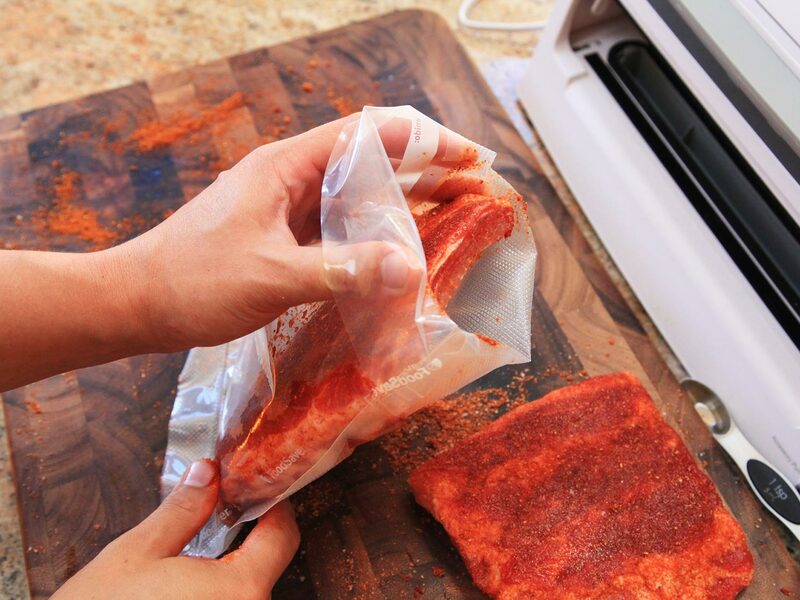 Place individual portions of rubbed ribs in vacuum bags. 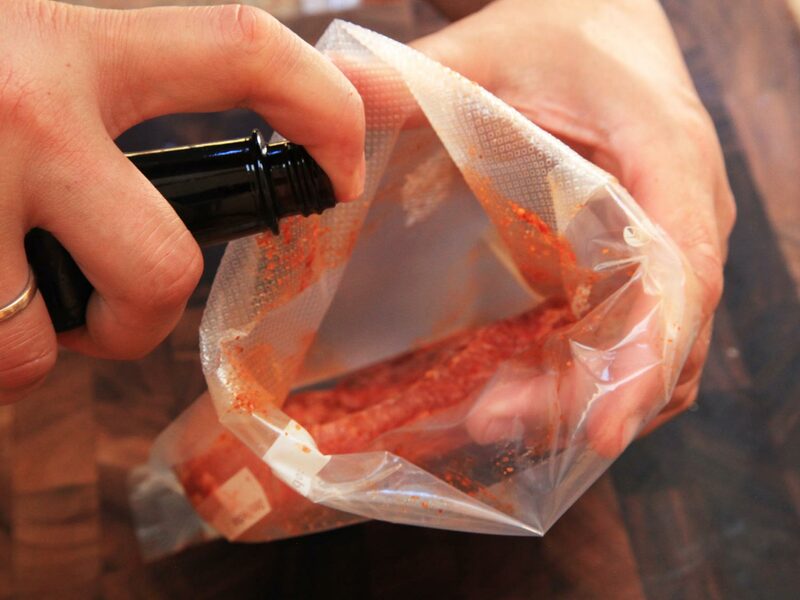 If using vacuum bags, fold over the top while you add the ribs so that no rub or pork juices get on the edge of the bag, which can weaken the seal. Add 4 drops (about 1/8th teaspoon / 1 ml) of liquid smoke to each bag. 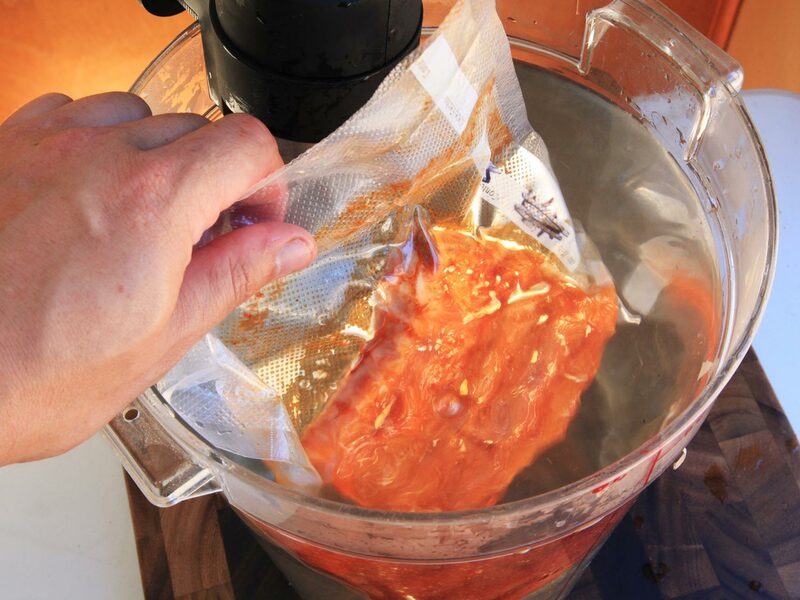 Seal the bags, transfer them to the refrigerator, and let them rest for 4 to 12 hours. 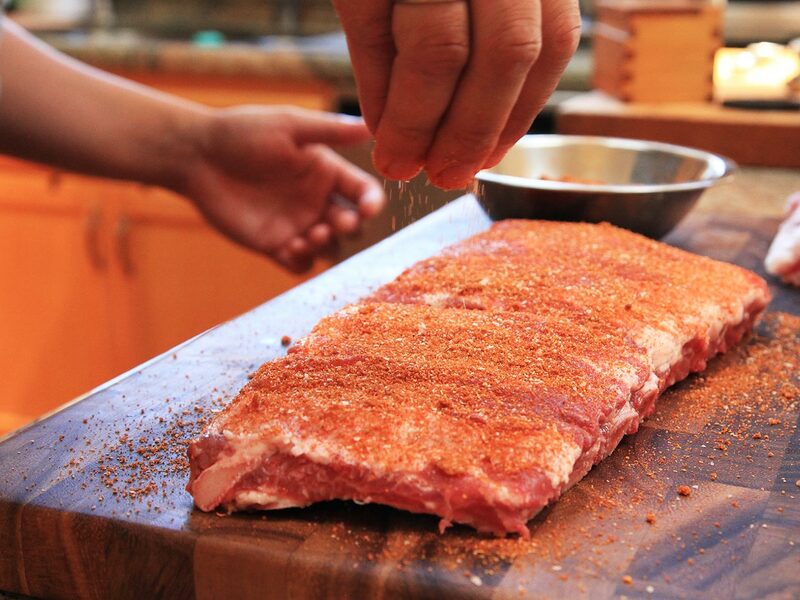 Set your Precision Cooker to 145°F / 63°C for extra-meaty ribs or 165°F / 74°C for more traditionally textured ribs. 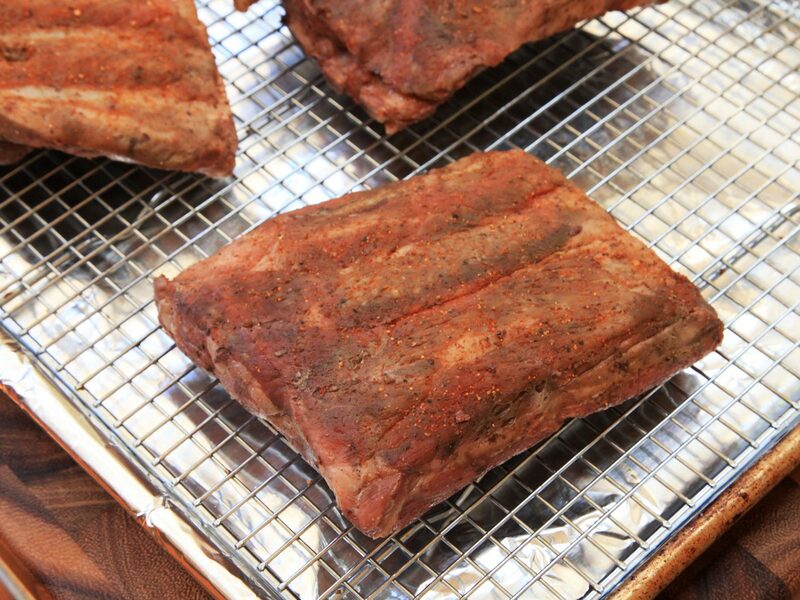 Add ribs to the water bath and cover with a lid, aluminum foil, or ping pong balls. 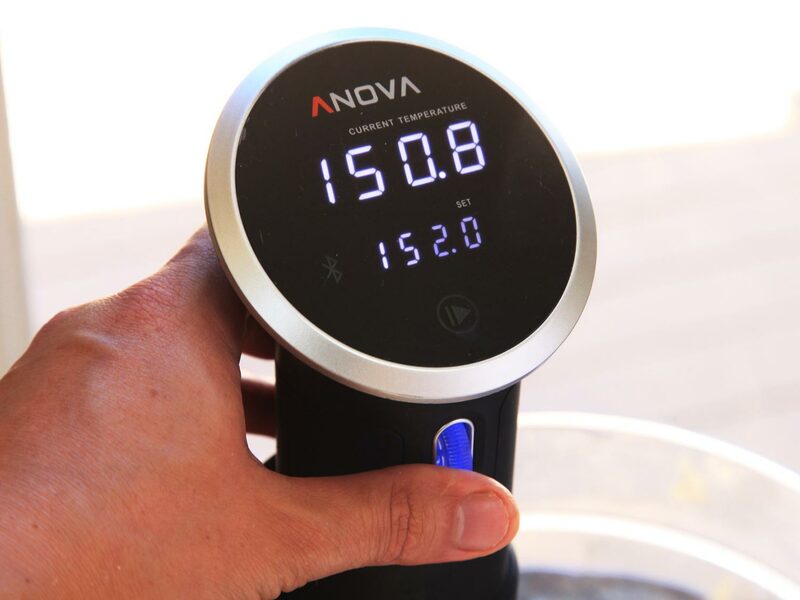 Cook for 36 hours at 145°F / 63ºC or 12 hours at 165°F / 74ºC. 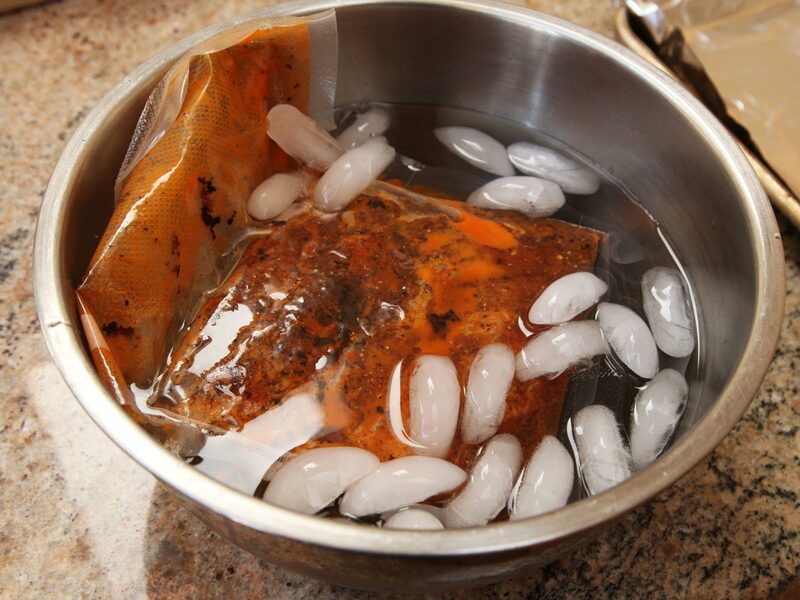 Transfer cooked ribs to a large bowl of water filled with ice to chill thoroughly. Ribs can be stored in the refrigerator at this stage for up to 5 days before finishing. 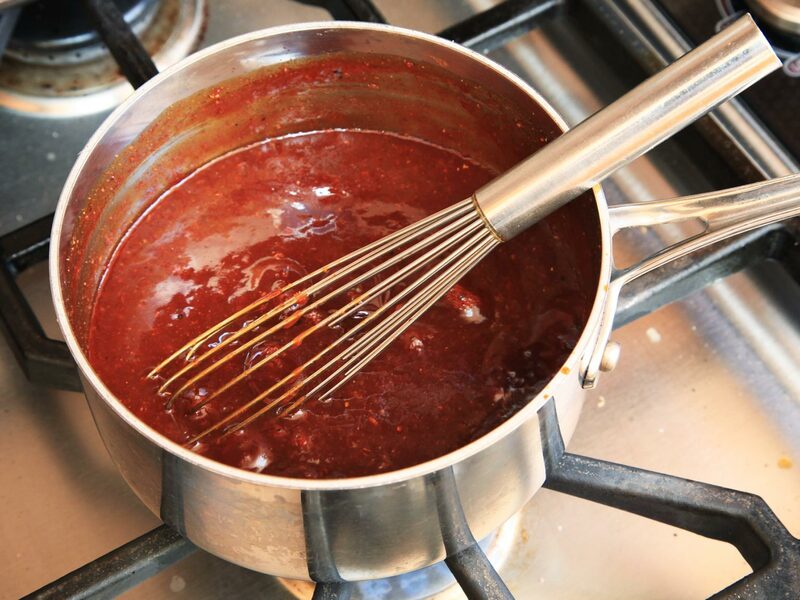 To make the sauce (skip if making dry-style ribs), combine remaining 3 tablespoons spice rub, grated onion, ketchup, mustard, molasses, Worcestershire sauce, vinegar, and remaining liquid smoke in a medium saucepan and whisk to combine. Bring to a bare simmer and cook until reduced and thickened, about 20 minutes. Set aside. 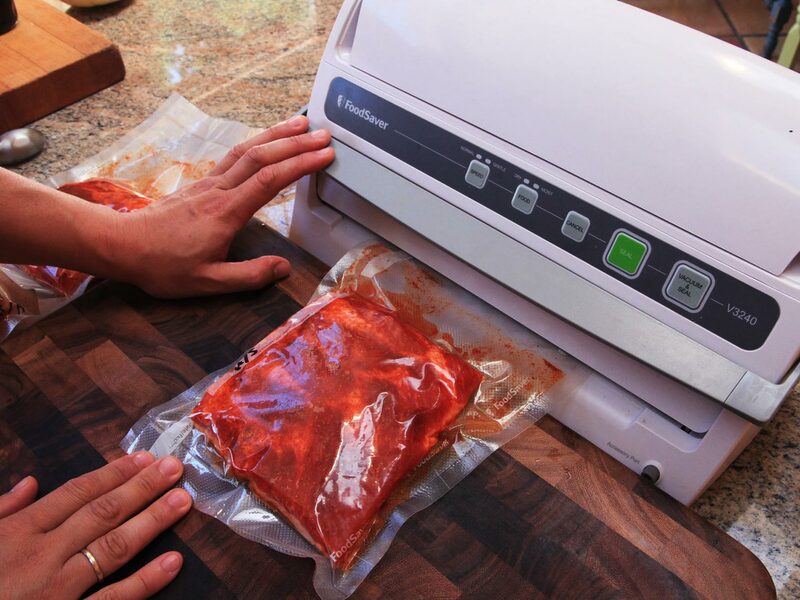 Remove ribs from vacuum bags and carefully pat dry with paper towels. If making dry-style ribs, rub with remaining 3 tablespoons / 45 ml spice rub. Adjust oven racks to upper and lower middle positions and preheat oven to 300°F / 150°C. Line two rimmed baking sheets with aluminum foil and place a wire rack in each. 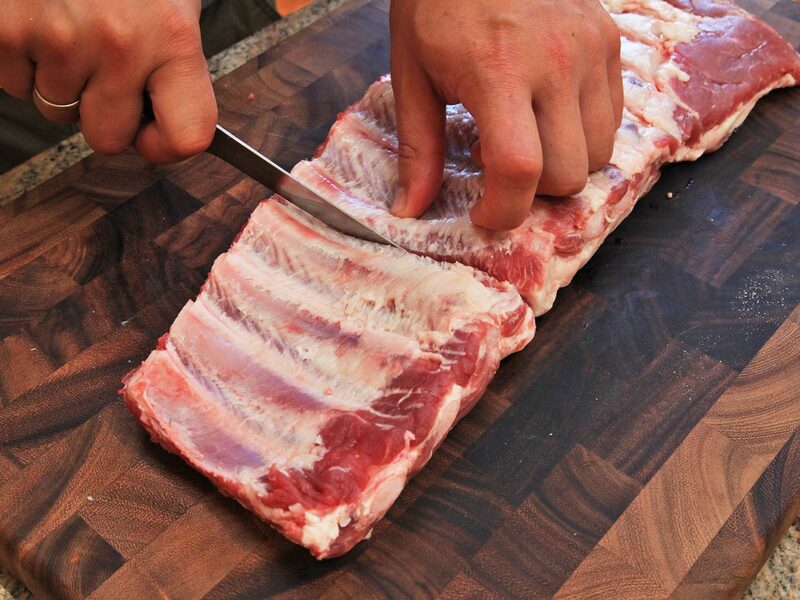 Divide ribs evenly on racks, facing up. Transfer ribs to oven and cook until surface is sizzling and ribs are heated through, about 20 minutes. 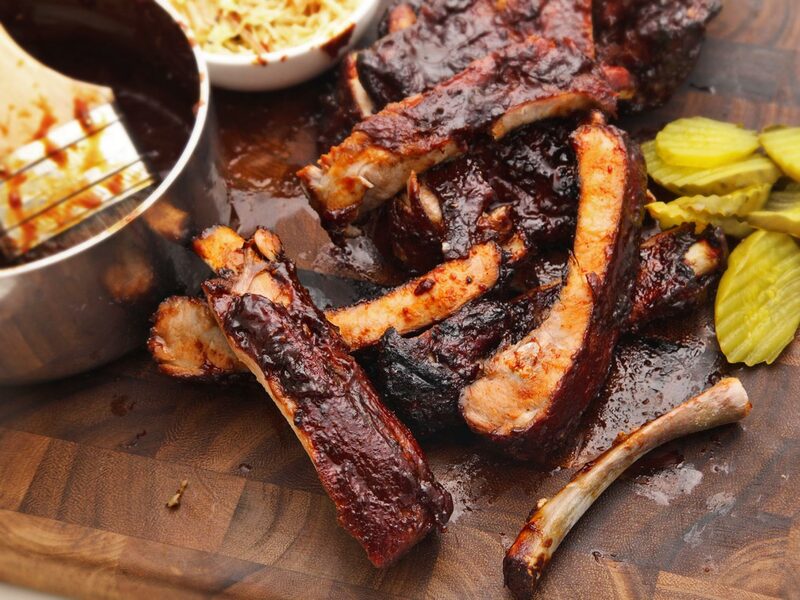 Brush ribs with sauce and return to oven for 10 minutes. Remove from oven, brush with another layer of sauce, and return to oven until it is dried and sticky, about 10 minutes longer. (For dry-style ribs, omit the saucing and continue roasting until a crusty bark has formed, about 40 minutes total in the oven). Remove ribs from oven, paint with one last layer of sauce, and serve, passing extra sauce at the table. Light one half chimney full of charcoal (about 2 1/2 quarts / 2 L of coals) When all the charcoal is lit and covered with gray ash, pour out and arrange the coals on one side of the charcoal grate. Set cooking grate in place, cover grill and allow to preheat for 5 minutes. Alternatively, set half the burners on a gas grill to the medium heat setting, cover, and preheat for 10 minutes. Scrape the grill grates clean with a grill scraper, then oil the grates by holding an oil-dipped kitchen towel or paper towels in a set of tongs and rubbing them over the grates 5 to 6 times. Place the ribs facing up over the cooler side of the grill. Cover and cook until ribs are heated through and dry to the touch, about 15 minutes. 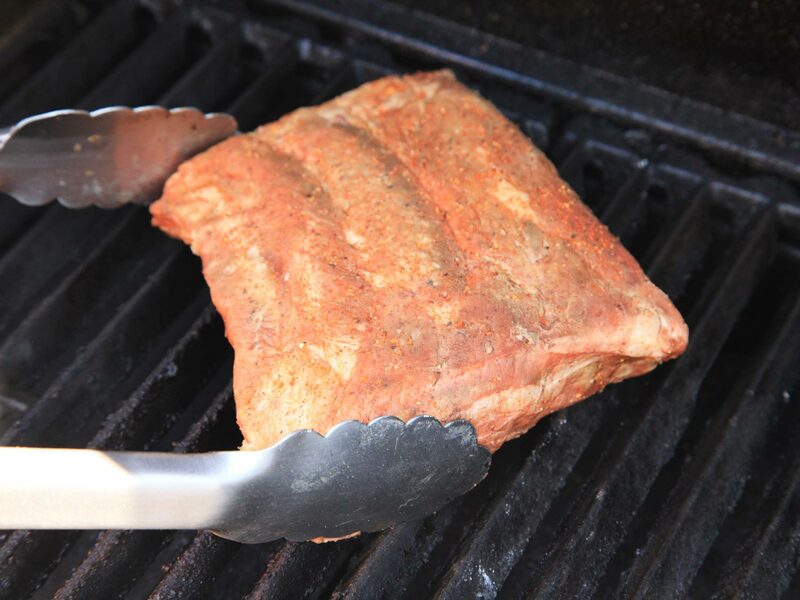 Brush ribs with a layer of sauce and then transfer the ribs to the hotter side of the grill. Cover and cook until sauce is mostly dry, about 7 minutes. Brush with a second layer of sauce, cover, and cook until second layer is sticky, about 5 minutes longer. 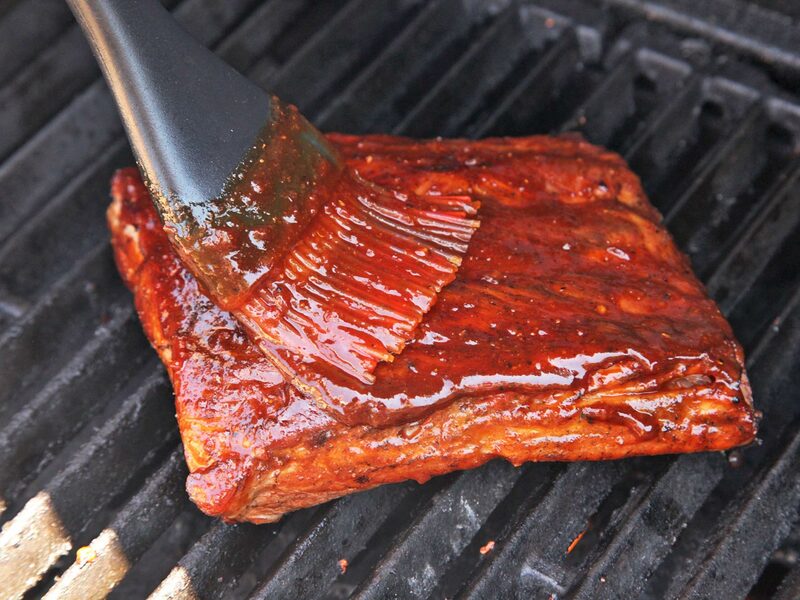 (For dry-style ribs, omit the saucing and continue grilling over the hotter side of the grill until a crusty bark has formed, about 10 minutes total over hot side of grill). 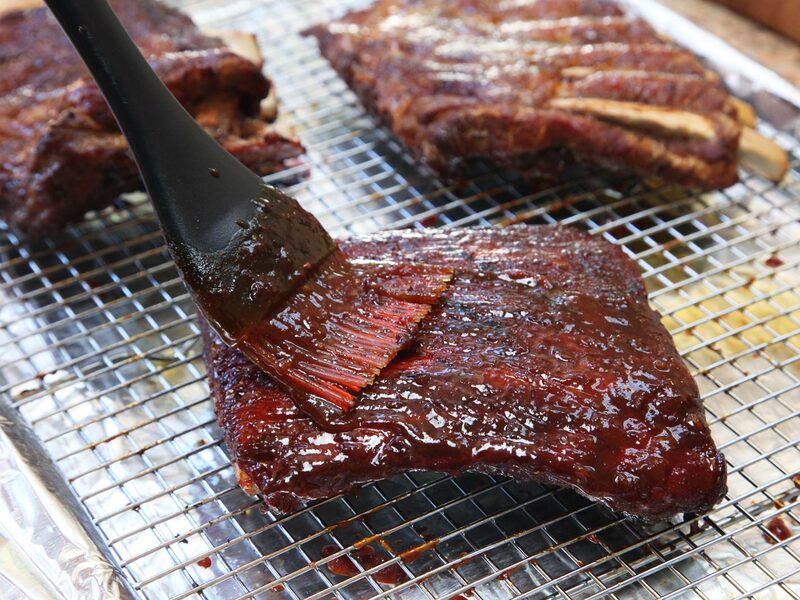 Remove ribs from grill, paint with one last layer of sauce, and serve, passing extra sauce at the table.